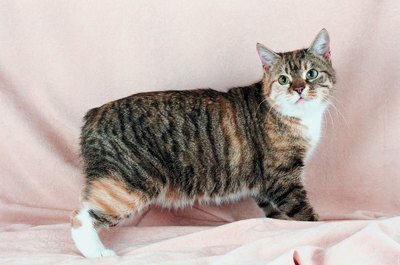 Manx kitties have a longer life expectancy than most other breeds. After a loss it's understandable to swear you'll never have another cat again ... but then an adorable kitten sinks her claws into your heart. If you want a guarantee of a longer time between goodbyes, there aren't any. But some domestic cats do have longer life expectancies than others. Most domestic cats have a life expectancy of about 10 to 15 years. A lot of factors, including genetics, can play into whether or not your cat lives to the older end of the spectrum. This means her breed can play a part in her longevity. If you want to adopt a kitty with a longer life expectancy than most, choose a Manx or a Siamese. These breeds' expected life span is 15 to 20 years, about five years more than the average for other cats. Although Manx and Siamese cats in general are expected to live longer than other cats, the record-holders for the oldest cats aren't of either breed. The official record holder for the oldest living cat is a 35-year-old Burmese, and an unofficial contender is a 39-year-old tabby. As for those who have passed on, one of the oldest on record was a Sphynx cat who lived to 34. Where a kitty lives can affect her lifespan, too. Indoor cats live two to three years longer on the average than their free-roaming counterparts. They aren't subjected to the disease, traffic or other dangers of outdoor cats. Also, cats who live indoors have healthier diets in general, as their humans can better monitor and control what they eat. No matter what breed your kitty is, you can put the odds in her favor and help her live a healthy, long life. Regular visits to the vet for vaccinations, and to monitor her condition, will help ensure her health. If she does become ill, medical treatment can begin immediately. Feed her a quality balanced diet, and provide her toys and other exercise encouragement to keep her fit and trim, as obesity can cut her life expectancy. Interact with your cat regularly and groom her frequently, and the two of you should have many happy years together. Daily Mail: Can Lucy, 39, Really be the Oldest Cat in the World? Can a Cat Be Broken of a Bad Habit? What Is the Best Method of Pet Transportation for Cats? Can a Domestic Shorthair Cat Enter a Cat Contest? What Do You Do With Dogs You Can Not Take Care of Anymore? What Age Are Siamese Cats Expected to Live? What Does It Mean When a Cat Bites You While Purring?